Dr. Zacariah Hildenbrand, chief scientific officer and partner at C4 Laboratories, is currently researching some of the lesser-known molecules in cannabis, and he’s on to something. His research focuses on discovering new molecules, determining their therapeutic effects and expanding our understanding of the constituents of cannabis. Dr. Zacariah Hildenbrand, chief scientific officer and partner at C4 Laboratories. Dr. Hildenbrand received his Ph.D. from the University of Texas at El Paso where he researched the molecular architecture involved in hormone-dependent cancers. At the University of Texas Southwestern Medical Center in Dallas, his post-doctoral research contributed to the development of a novel therapy for the treatment of chronic myeloid leukemia, a blood-borne cancer that afflicts small children. He has published over 25 peer-reviewed scientific journal articles and hopes to do the same with his research in cannabis. 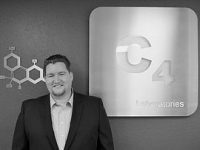 After a career of scientific consulting, Dr. Hildenbrand met Ryan Treacy, founder and chief executive officer of C4 Laboratories, in 2015 when Treacy launched the company. In June of 2015, the laboratory began operations, providing Dr. Hildenbrand the opportunity to embark on a new and exciting field of research- cannabis. Ryan Treacy, founder and chief executive officer at C4 Laboratories. They currently collaborate with Dr. Kevin Schug of the Shimadzu Center for Advanced Analytical Chemistry (SCAAC) at the University of Texas, Arlington and together Drs. 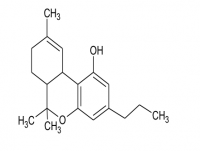 Schug and Hildenbrand are pursuing a DEA license to expand their current cannabis research. The SCAAC is a $10.0+ million analytical laboratory with instrumentation that only a handful of people in the world has access to. 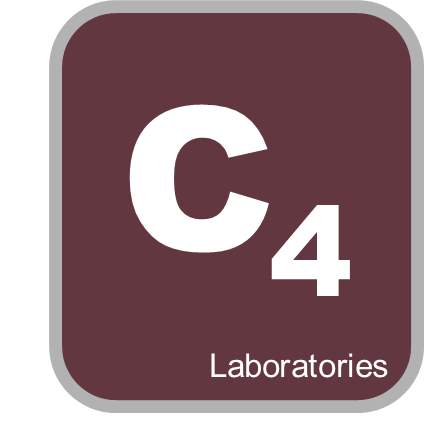 C4 Laboratories, based in Mesa, Arizona, currently offers a range of services for cannabis analysis including terpene and cannabinoid analytics, microbial, pesticide, fungicide and insecticide testing. In addition to the standard gamut of tests, they also specialize in cultivation analytics like mold and mildew culture testing, viral detection with sentinel plants and comprehensive analysis of environmental conditions. 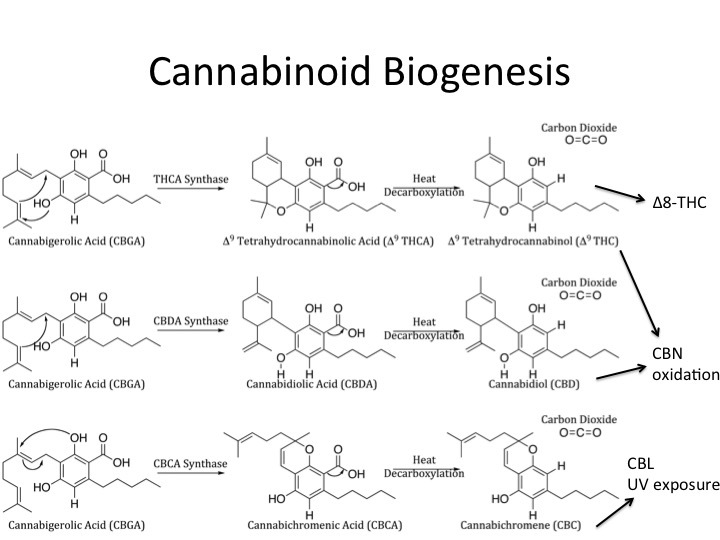 What makes their company unique is their multidisciplinary effort to characterize the therapeutic compounds found in cannabis, the C4 Cannabinomics Collaborative. 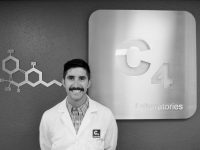 We sit down with Dr. Zac Hildenbrand to talk cannabis science, his research and what they hope to accomplish with the C4 Cannabinomics Collaborative. CannabisIndustryJournal: What is the C4 Cannabinomics Collaborative? 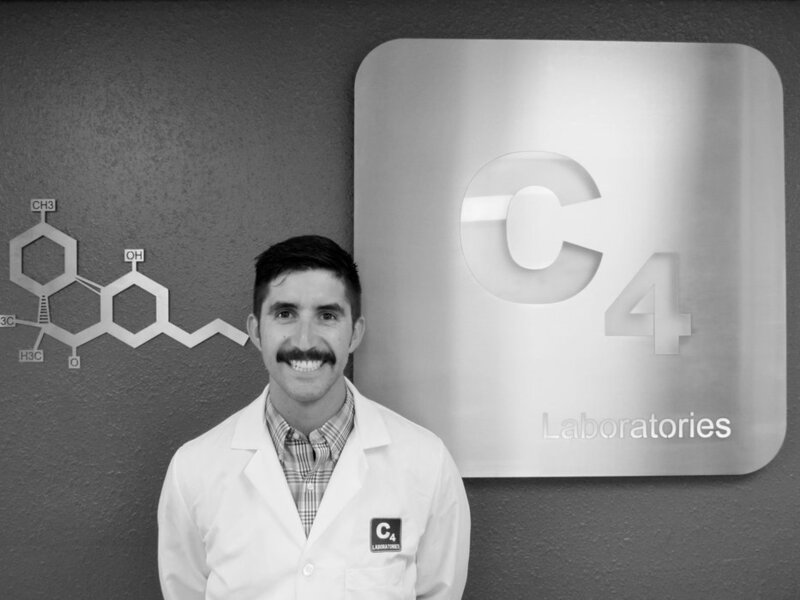 Dr. Zacariah Hildenbrand: The C4 Cannabinomics Collaborative is an open collaboration between growers and scientists to discover new molecules in cannabis and to have a better characterization of individual cannabis strains based on the active constituents found in each sample. We are facilitating the collaboration of some of the world’s best cannabis growers with world-class scientists to find new information about the plant. What we want to accomplish in this work is identifying novel molecules. Because of the [federal government’s] restrictions in researching cannabis, there is very little peer-reviewed literature on many of the compounds found in cannabis. We want to secondarily find out what those molecules do in the human body and thus make recommendations for strains targeting specific conditions. We also want to understand the strains currently out there by determining the most established cannabinoids and terpenes via chemotyping. You hear a lot of people talking about the effects of an Indica or Sativa and making recommendations based on that. We want to find chemical signatures based on cannabinoids and terpenes and make recommendations based on that. There are a lot of problems at hand when discussing strain names scientifically. There are nomenclature issues- people calling the same strain different names, people giving multiple names to the same strain to make it appear that their strain portfolios are more diverse. We can identify the chemical signatures in strains based on the major cannabinoids and terpenes. Based on the terpenes and chemical profile we can determine more accurate recommendations for patients as well as in recreational applications. All of this, again, discovering the new molecules, identifying the current strains, is so we can make more informed decisions regarding cannabis use. It is not a panacea but it is a very robust plant. There are a lot of terpenes with anti-inflammatory responses. Other molecules help with blood flow, sleep, regulating blood glucose, and we all know the cases of CBD helping children with convulsions and epilepsy. We want people to make sure they have the most up-to-date information. CIJ: How is your collaboration with the SCAAC at UT Arlington contributing to this work? Dr. Hildenbrand: One of the instruments we use there is a supercritical-fluid-extraction supercritical-fluid-chromatography mass-spectrometer (SFE-SFC-MS). With that instrument, we can do the extraction on the machine with an extreme level of sensitivity. It is ideal for drug discovery and identifying molecules in the parts-per-quadrillion range. This particular instrument allows us to detect molecules with an extreme level of sensitivity without volatizing them during the sample extraction process. We want to acquire samples of unique cannabis from growers that will work with us to discover new cannabis constituents. We are in the process of getting a DEA license so that we can send products across state lines to the center at UT Arlington to perform the advanced characterization. They have instrumentation that only a handful of people in the world have access to, which gives us the best opportunity to explore the unknown. When we discover new molecules, find out what they do on the molecular level, we can then isolate these compounds and ultimately use this newfound knowledge for the development of effective nutraceuticals. CIJ: What molecules are you researching right now? Dr. Hildenbrand: Some of the low-hanging fruit in our research looks at identifying compounds similar to the better-studied compounds such as THC and CBD. 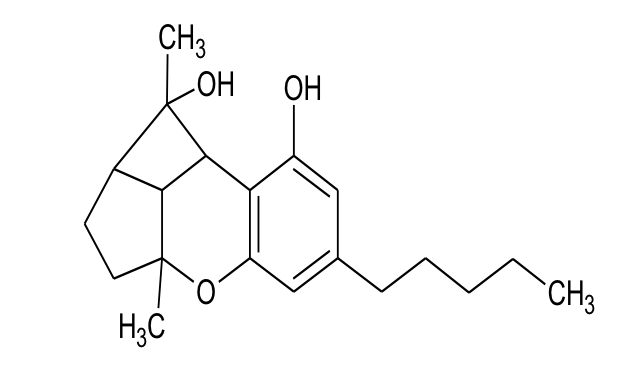 THCV has a very similar structure to THC, but has a shorter acyl carbon chain (3 carbons vs. 5). THCV doesn’t induce a psychoactive response (like THC), but it does improve fat utilization, so it has remarkable potential for medicine. We are looking at what conditions are required for it to occur naturally. 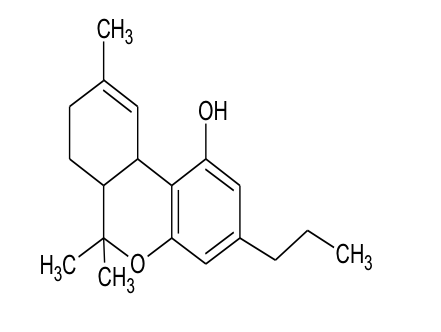 Cannabis doesn’t produce THCV in a high amount. 0.7% by weight is the most we have seen in Arizona. In Oregon, where craft cannabis has been refined to a much higher degree, we have heard rumblings of some strains containing up to 3% THCV. We want to find out if this is a possible weight loss tool. Our research in CBDV is very much the same. CBL is the breakdown product of CBC when it is treated with ultraviolet light. We know absolutely nothing about what CBL does. If we find a strain that produces high amounts of CBC, we can then treat it with UV light and force the conversion to CBL, and then ultimately determine what it does. This is a good example of low-hanging fruit and the versatility of cannabis. 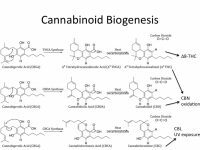 Based on the biogenesis of the cannabinoids, we can alter the profile of cannabis products using a series of biochemical reactions. For example, we have been helping clients in Arizona look for a quality sleep aid in cannabis. Certainly, Indica strains will help, but the molecule CBN helps specifically with sleep abnormalities. As CBN is formed as a byproduct when CBD or THC are oxidized, we see some producers using liquid nitrogen to oxidize CBD, leading to higher CBN levels. I would like to think we are in the age of understanding CBD, THC and the major terpenes,but there are a whole milieu of compounds that require our attention and THCV, CBDV and CBL are just a few that we want to devote our efforts to right away. CIJ: What are your plans in the immediate future? Dr. Hildenbrand: We are in the process of finalizing the documents to bring a C4 laboratory into Oregon where we can do quite a bit of research and where we’ll have access to some very unique cannabis. We will offer full compliance testing per ORELAP and OLCC regulations, but we also want to acquire samples (free of charge) from growers that want to collaborate with us to discover new molecules. We’ve been lucky enough to start working with growers like Adam Jacques and Chris West in Eugene, but we also want to be available to other growers who want to contribute to this research. CIJ: What are your long-term goals with this project? Dr. Hildenbrand: At a basic level, we hope to expand the current understanding of the cannabis plant. There is a lot of “bro science” and anecdotal claims out there. There is so much that we don’t know about cannabis that we cannot simply rely on anecdotal claims for each strain. We want to bring cannabis into the same light as any pharmaceutical-grade or biomedical research. We need to be characterizing this plant with the same level of detail as other pertinent molecular therapies. In doing so there are a lot of potential discoveries to be made and we might be able to unlock the future of medicine. A drug like Marinol, for example, has been met with mixed reviews because its only one dimensional. Furthermore, we find that the terpene molecules are tremendously beneficial and this interplay between cannabinoids and terpenes is something that we want to explore further. All and all we wish to further illustrate the therapeutic capacities of cannabis within the contexts of specific ailments and medical conditions, while discovering the medicine of the future.